Flash is an extremely versatile animation tool. We use it to create websites, banners and all types of creative and useful applications. From carbon footprint calculators to bank comparison apps, we build all of our interactive applications from idea up. How do you engage a new user to a website and keep them coming back for more? Truth is, if there was just one answer to this we'd be out of a job. Every case is different, depending on your target audience and business. In this example, we designed a novel application, to be embedded into a social networking website. And, rather than simply following the typical rules of new user log-ins (ie. name, age, address etc.) 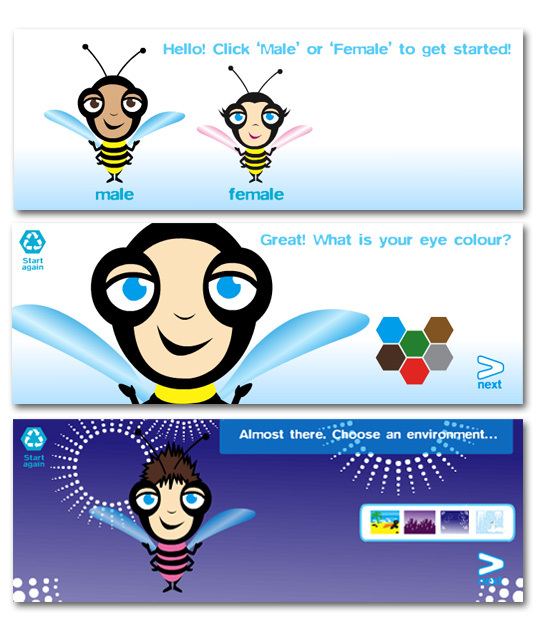 each new member to the site could create and customise their own individual (bee) character to distinguish themselves from other members (bees). Design your own bee here. For further examples of our digital projects, visit the Mavo portfolio.